In the music industry, especially churches, community music schools, colleges, and K-12 schools, things tend to be pretty traditional. Often, the people interviewing and hiring at these organizations will be looking for a pretty standard résumé format: clean and simple, black and white, two pages or less. That doesn’t mean you can’t mix it up and have a résumé that’s a little more modern, but it is something to keep in mind as you polish your document and get it ready to submit somewhere. Who will be reading this? What is the best way to connect and communicate with them? 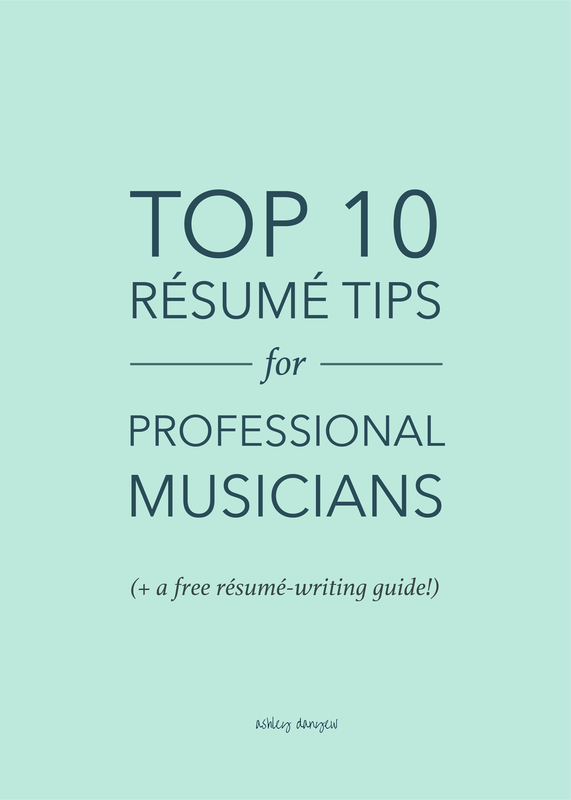 I’ve advised students and other young music professionals on their résumés and after seeing and editing dozens of résumés over the years, I put together a list of some of my best résumé-writing tips, specifically for musicians. Whether you’re getting ready to apply for a new job, a grant, grad school, or some other professional opportunity, or you’re just looking to polish up your résumé and keep it up-to-date, I hope you find something helpful in this post that you can apply to your résumé. Enjoy! This one is so important, I decided to put it first on the list. Here’s why: Your résumé is your first impression with the people you’ll (hopefully!) be interviewing with, so every little detail matters. Consistency in your formatting and writing is huge. Your résumé will do the talking. If you list work dates in one place as “2012-2015,” use this formatting throughout. Don’t switch to “Aug. 2014-Mar. 2016” in another section of your document (or vice versa). Use an en dash (-) in dates rather than an em dash (—). Use numbers for dates, ages, and grade levels; otherwise, spell them out (i.e. "Taught three lessons in two 2nd grade classrooms”). Capitalize all titles and roles (e.g. "Lead Teacher," "Small Group Instructor," "Section Leader,” “Guest Musician"). 2. Include only your most relevant work experience (not necessarily everything you’ve ever done). If you’re just starting out, it’s good to include all relevant work experience on your résumé, even if some of it isn’t music-related. But, as you build a career and gain more experience, it’s important to start editing what you include on your résumé. Choose the most relevant work experience for the particular job you’re applying for to show that you have experience and are qualified for the position. Often, this experience is listed in reverse-chronological order, with current or most recent experience at the top of each section. 3. Make sure you have a clear, bulleted list of details for each experience. Start each one with an action verb like "teach," "facilitate," or "perform.” Use past tense verbs for jobs you did in the past and present tense verbs for jobs you currently have. What ages and skill levels have you taught? Have you prepared your students for any recitals, competitions, or special performances? What programs have you planned or organized? How many students and classes do you teach on a weekly basis? Remember, you’re telling the story of what you’ve done and what you currently do as you write these descriptions, so be specific, honest, and intentional with your word choices. Don’t just use the same verbs over and over again - add variety, make it interesting for someone to read. Thanks for signing up! Click here to download your free resume-writing guide. 4. Use a clean, easy-to-read font and 11-12 pt. font size. Keep the body of your document simple. Consider using a different font for your heading (your name), though make sure it is legible and easy to read. Think of this like a newspaper heading: use a larger font size and consider increasing the character spacing (the space in between each letter or character) to add white space and help with readability. Underneath your heading/name or in the footer area at the bottom of the page, be sure to include your contact information. 5. Start with your educational experience. Traditionally, this information is the first section of your résumé. If you’re just starting out, it’s acceptable to list your high school and college information. Once you have some experience (and maybe even a certificate or graduate degree, too), I’d recommend just including your college degree (and beyond). 6. Organize your work experience by category. Once you have your jobs and work experience divided up, then put the categories in an order that matches the job you’re applying for. For instance, if the job is a teaching position of some kind, put any teaching experience you have up front, followed, maybe, by any administrative experience. Then, put your performance experience and other work experience after that. Make sure your document is not overly cluttered. Leave margins on all four sides and make sure you include some white space throughout: indenting bulleted lines a certain amount, leaving space in between sections, maybe even adjusting the line-height spacing to 1.3, or so. 8. Ask a few people to serve as references. It’s up to you whether or not you want to include these names at the end of your document (you should include a References section, but you can simply say “Available upon request”), but you should have three, or so, references on standby, in case you are asked to provide them. Typos happen to everyone. Make sure you take a few minutes to proofread and spellcheck your document a second (and third!) time before submitting it somewhere. Or, better yet, ask someone you trust to review your résumé for you and give you their thoughts and suggestions. capitalizations: are there words capitalized that shouldn’t be? people’s names: are they spelled correctly? Did you include their titles, if applicable? your references’ contact information: is it up-to-date? your contact information: is it up-to-date? words that can be spelled two ways (e.g. lead vs. led): did you use the right one? 10. Keep it short (two pages or less). Again, most employers are going to be looking for a 1-2 page document. In the case of some college positions, a CV may be requested. A curriculum vitae (CV) is a longer document that is meant to include everything you’ve ever done - all of your teaching experience, administrative work, performances, grants/awards, classes you’ve taught, and so on. Résumés, however, should provide a quick overview of who you are and what you’ve done without going into every little detail. Also, be sure to include your last name and a small “p. 2” in the top-right corner of the second page, in case the pages get separated somehow.